Integrative Therapy sessions carefully orchestrate the Five Healing Modalities to individually address each patient’s needs. Yoga therapy is employed to relieve the symptoms of PANIC (Pain, Anxiety, Nausea, Insomnia, Constipation and Exhaustion): Subtle In-bed movements relieve anxiety, improve circulation, minimize constipation and decrease insomnia. Restorative poses and Breath awareness enhance circulation, digestion and respiration, and body scanning minimizes pain and releases anxiety. Reiki is a Japanese vibrational energy therapy facilitated by light touch on, or slightly off the body, balancing the human biofield. 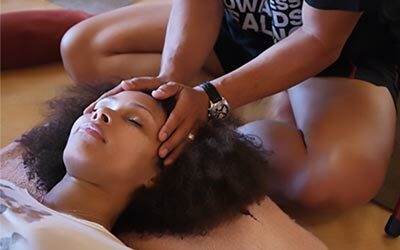 Reiki treats the whole person and thus produces beneficial effects on body, mind, emotions and spirit, such as feelings of peace, security, relaxation and well-being. Essential oil therapy relies on natural oils derived from plant material and is used to promote relaxation, help relieve stress, and has also been used to help treat a wide range of physical and mental challenges. Urban Zen Integrative Therapy emphasizes mindfulness of illness as a ground for the experience of living and caring for life. UZITs have been trained to cultivate deepened qualities of attention, ethics, insight, compassion and resilience, as well as the implementation of meditation and reflective practice, to effectively accompany sick people and their families through the experience of illness. Nutrition, along with a healthy environment and lifestyle, is integral to achieving optimal wellness and has a profound influence on health, healing and longevity and in preventing disease. Today, nutrition research and its clinical applications, along with nutritional assessments and health promoting strategies, are being harnessed by Integrative Therapists, resulting in positive outcomes including pain alleviation and improved digestion.